Jenica had come to my 3-day live event for Christian Lifestyle Coaching (CLC). Miss Jenkins is the very first student to graduate from CLC and to become a Set Free Coach. Students of CLC create their own ministry or business, but Jenica wanted to work as a Coach within our Connecting LLC organization. We’re more than happy to have her part of the Set Free team! She loves teaching believers how to truly be FREE from whatever holds them back from loving God, themselves or others. 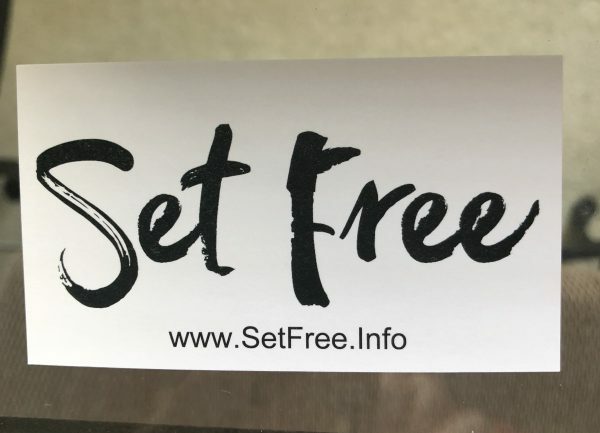 That’s what Set Free is all about! After obtaining her certificate from us, she went on to a 10 week course in the Business Entrepreneur Academy in Greenville, SC. This Academy was just what she needed. I was very excited and more than ready to go to her graduation. I slowly started to take one pen out of the little pouch. I try to obey this powerful voice within when I hear it, so I took the entire pouch, stuffed it into my purse and headed out the door. As soon as I got in my car I heard, “Take business cards”. My husband laughed while I’m racing back and forth through the house and finally out the door. I’m usually punctual so the extra minutes to do these steps were not my idea, especially since it made no sense to me. “Pitches” aren’t something I teach in the CLC event, so I was impressed by her succinct statement. “Nice job Coach!” I said as I snapped this picture. I should have figured business cards on the table would be a ‘thing’. This was an entrepreneurial event after all. I didn’t go near the table, in fact, I had no intention of going near it at all. I ate, I mingled and supported my friend just as I came there to do. “Put your cards on the table.” I heard again. I know enough to obey when I hear things more than once, so I reluctantly walked over to the table. There were 35 cards in my bag, yes I counted. I put half of them off to the side of the graduating students’ cards, which were looking pretty new and spiffy I might add. Some were attractive and some were plain, but there was 15 to 20 different businesses represented. I stepped away immediately to talk to a person in front of me, feeling a little funny about depositing my cards. After five minutes, I glanced back at the table and would you know, every single card of mine was gone. Gone! In five minutes! “That’s so strange” I said aloud. I immediately suspected a little boy by the table may have taken them off. No worries, I had plenty more to replace them with. I set the rest of my cards in the same spot and went to walk away. “Umm…but…what if they get pennapped by that boy too? !” Came my immediate response. “Put down your pens and watch.” Is what I heard. I reluctantly took two of the Set Free pens out of my purse. “All of them.” came the voice. So I placed them on the table next to my new stack of cards. I stood a few feet away to watch, believing the cute little boy in the room would have them in hand before the adults would. I couldn’t have been more wrong. Most savvy business folks will tell you that in networking events it is best to give your card out to those whom you want to do business with. In other words, create the well, not the ocean. In this case, the ocean was being stirred. I know the odds of the ocean of people going to my website or doing any follow up and they are about 1%. Today it appears that at least 20% have gone to the site and received the 10 free tools I’ve worked so hard on to share. How cool is that!? I know more people will eventually be Set Free from anxiety, bitterness, generational sin, etc. That is most exciting to me. Listen, there is NOTHING easy about being an entrepreneur, but if I hadn’t listened to that inner voice, those cards wouldn’t have been in my hands. The key to EVERYTHING is to OBEY the inner voice when you hear it. It is the work of the Holy Spirit. I’m super happy for Jenica Jenkins. I’m also thankful she did the prep work in that room long before I arrived. She talked about being Set Free during the 10 week course, and everyone remembered what she said. Many have already signed up for the 10 Set Free Tools on the home page of this site. That’s amazing! I’m grateful to know there is a strong purpose for our Set Free Course and I hope you take advantage of the opportunity to grab the tools for yourself using the form below. Everyone LOVES what they’ve learned from them and we stay in touch with you to keep you motivated in the spirit! So go ahead and sign up to get yours now. Download the Set Free Ten Tools to help you heal areas of life that you rarely talk about, (Forgiveness, anxiety, self-control, money, etc). Submit your first name & primary email below to get the 10 tools now. We protect your info and only send the tools and empowering information to you.